Marsh samphire (sea asparagus/sea beans) is a sea vegetable that grows on the shore and in dunes, marshes and mudflats. Seawater regularly washes over it and, when the tide is in, it is underwater which gives it a briny flavour. While it used to be harvested in the wild, some farmers have been so successful at creating a coastal environment that samphire can now be cultivated. Marsh samphire should be eaten relatively young, while the shiny deep-green stalks are firm and strong, as later in the season they get tougher and less appetizing. At one time it was best not to buy wild marsh samphire after the end of July but now that it is being cultivated, young samphire is available all year round. 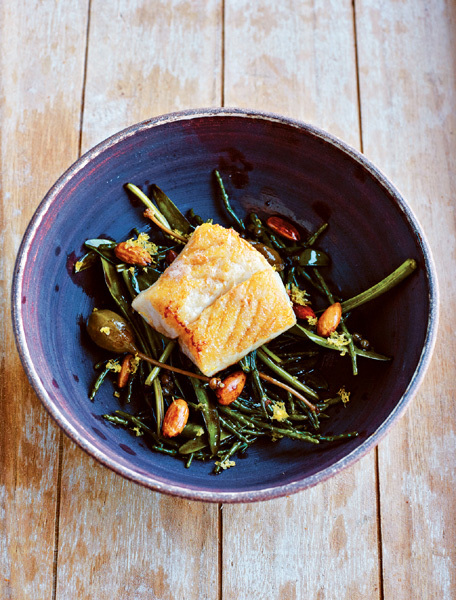 It’s a lovely vegetable with a briny flavour that combines beautifully with fish. Take care when preparing it, though, as, the more you rinse samphire, the less briny it will taste. Heat 10 g/½ oz/1 tablespoon of the butter in a frying pan (skillet) over a medium-high heat. Add the almonds and fry until they are golden brown. Drain the almonds from the pan and set aside. Wipe out the pan with kitchen paper (paper towels). Pat the fish dry with kitchen paper and season with salt and white pepper. Coat the fish all over in flour, brushing off any excess. Heat 4 tablespoons of groundnut (peanut) oil in a frying pan over a high heat and brown the fish on both sides for 3–4 minutes, depending on the thickness of the fillets. Lower the heat, add 20 g/¾ oz/1½ tablespoons of the butter and, when it has melted, tilt the pan and baste the butter several times over the fish with a spoon. Drain the fish from the pan with a spatula and cover the fillets with foil to keep them warm or place in the oven on its lowest setting. Melt the remaining butter in a clean frying pan and add the marsh samphire (sea asparagus/sea beans) and sea lavender. Skewer the garlic clove on the prongs of a fork and stir it around in the pan for 1–2 minutes until the vegetables are translucent. Add the caperberries and almonds and season with a little pepper. It’s not necessary to add salt as the sea vegetables are sufficiently salty already. Divide the vegetables between four serving plates. Scatter over the lemon zest and drizzle with some of the buttery juices from the pan. Top with the fish fillets and serve.